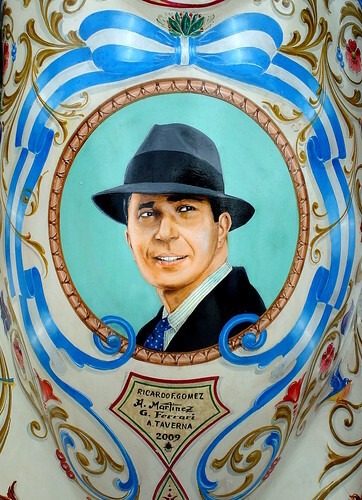 The Museo Carlos Gardel is a great place to go to find out more about the tango legend. A temporary exhibition of Mercedes Simone, one of tangos most important female voices, is being hosted. Additionally the museum offers live music on Mondays at 6.30pm. In the evening Morcheeba is presenting their new album at Estadio Luna Park at 9.30pm. Opening hours: Monday-Friday from 11am to 6pm. Saturdays and Sundays from 10am to 7pm. Tuesdays closed. For a magical view of Buenos Aires history take a tour of the “Zanjon de Granados,” a unique experience of urban archaeology and architecture. Later on in the evening have dinner at charming traditional “rotisería” Miramar which offers typical Spanish influenced Argentine food. Visit the Evita museum for a closer look at one of Argentinas most controversial political figures. In the evening at 9pm great opera singer Placido Domingo is offering a free show at the Obelisco. One of the architectural landmarks of the city is the famous Palacio Barolo. Construction of this regal building full of references to poet Dante Alighieri began in 1919 for what was to be the tallest structure in Latin America. Guided tours are available Mondays and Thursdays from 4pm to 7pm and evening guided tours on Mondays and Wednesdays at 8pm and Thursdays at 8.30pm includes tasting of an awarded wine and a national delicacy. Thursdays are also the party night of the week and Club Niceto hosts their famous club 69 party. Take a stroll down the Botanical Gardens and check out the temporary exhibit of underwater photography being hosted. In the evening treat yourself to a special dinner at Pura Tierra where owner and chef Martín Molteni offers the best Argentine cuisine using carefully selected seasonal ingredients. “La noche en vela” is a Buenos Aires all nighter event inspired by Paris’s “Nuit Blanche.” Free activities will be hosted from 7pm to 7am offering a unique experience of contemporary art, music, tango classes, contemporary dance, performances, 3d mapping on the recoleta cemetery and other fun surprises. After Saturday nights events, Sunday will be a day to get up late and go to Plaza Serrano to check out the independent designers exhibiting at the traditional weekend fair. Whilst your there, Oui Oui is a great tea house close by where you can stop for some well deserved treats! This entry was posted in Uncategorized and tagged Agenda, Botanical Gardens, buenos aires,, Evita, Gardel, Live Music, Morcheeba, nightlife, obelisco, Palermo, Placido Domingo, tourism by Fierro Hotel Staff. Bookmark the permalink.